A mover property that is responsible for controlling how the Actor moves. This is assigned with setMotion(). An optional Avoider that makes the Actor avoid objects. 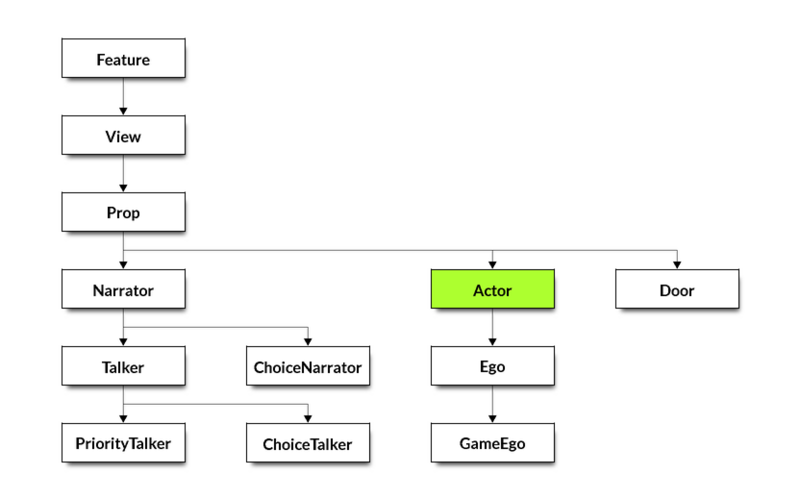 Optional “blocks” that indicate areas the Actor can or can’t be. heading The angle direction the Actor faces. noun The noun for the Actor (for messages). case The optional case for the Actor (for messages). nsTop “Now seen” rect. The visual bounds of the Actor. yStep The number of pixels moved in the y direction each cycle. view The view for Actor. brTop The “bounds rect” (near the feet of the Actor). cycleSpeed How quickly the Actor animation cycles. cycler Cycle attached to the Actor. scaler Scaler object attached to the Actor. moveSpeed How quickly the Actor moves. mover The Motion object attached to the Actor. Sets the position of the Actor. Sets a loop on the Actor, or sets an object that controls which loop is used. loop (number) – A loop number. loopClass (class) – A class that has a doit method that controls its client loop (e.g. see Grooper). looper (heapPtr) – An instance of a looper class. Assigns a mover object to the Actor. The mover is initialized with the Actor and any sendParams that have been provided. theMover – A class name, or an instance that inherits from Motion. sendParams – Any params that should be forwarded to the mover’s init() method. Movers control the Actor’s motion, whether it be via mouse or keyboard input, or some in-game logic. Specifies the control colors which the Actor’s movement. This is not used commonly in SCI1.1. Constraining an Actor’s motion is generally done with Polygons instead. Specifies which control colors should no longer block the Actor’s movement. Adds a block (an instance which inherits from Blk) to the Actor’s list of blocks. These control where an Actor is allowed to go. In SCI1.1, these have generally been replaced by Polygons. Removes a block from the Actor’s list of blocks. Returns TRUE if the Actor is not moving, FALSE otherwise. Returns TRUE if the Actor is inside the specified rectangle, FALSE otherwise. Provides a bitmask of the control colors on which an Actor is located. fUsePoint (boolean) – If TRUE, the Actor’s location is used. If FALSE (or not specified), the Actor’s base rectangle (near its feet) is used. A bitmask of ctl flags. These should usually be tested with the & operator. the distance between this Actor and the object. Returns TRUE if the Actor can’t be in its current location. Sets the pixel increments in which the Actor moves. Bigger increments means the Actor will cover larger distances in each frame. newX (number) – The xStep, or -1 if not provided. newY (number) – The yStep, or -1 if not provided. fDontSetOrigStep (boolean) – Optional flag telling us not to set origStep. Sets the direction that the Actor faces. newDirection (number) – One of CENTER, UP, UPRIGHT, RIGHT, DOWNRIGHT, DOWN, DOWNLEFT, LEFT or UPLEFT. Sets the angle heading of the Actor. Sets the speed of the Actor. This controls both the move and cycle speed.